Our son and his wife got married ten years ago in her aunt's parish church in lower Manhattan on October 13, 2001. It was always to be a simple wedding - just family including grandparents, aunts and uncles and selected first cousins, and of course Charles and Christine's closest friends. It was always to be a simple wedding - less than 100. But after the planes hit - once we found out they were still alive - she worked in the financial district and he on 34th - in the shock and profound grief of the days after 9/11, their wedding got a lot simpler. Such as Could it happen? The hotel where half the people were to stay - damaged, closed. Such as Should people come? Should our relatives - some old and some with little children - from Georgia and Mississippi and Ireland and Colorado and Arizona and Louisiana and England and DC- have to get on a plane and come to this small thing, this simple wedding. We thought about it and so did Christine's parents and we quietly said to our families - listen you don't have to come. We're going ‘cause they're our kids. But you don't have to come. Well this seems like a small thing - but our families came. And Charles and Christine's friends came - to a simple wedding in a wounded, grieving city - a small thing - and also immeasurable, ephemeral yet eternal - and I believe of such is the kingdom of heaven. During the wedding weekend, there was, yes, complex joy from the restaurant staffs where we had the parties. The rehearsal dinner spot was about 20 blocks up from the blast. When I had set up the party six months before, I remember being nervous talking on the phone with their staff person. She sounded, you know, like New Yorkers do. But when we got there on October 12, 2001, we were, she said, their first event "after" - their first profitable night, and she turned out to be the little sister of the chef; and she and the chef gave us a photograph that he had taken of their parents' fishing village in Italy. And they were so kind and so sad and so grateful because a young couple did a small, hopeful thing like get married in the ruins of the city. And so the New Yorkers helped us and we helped them in little ways to rise to that small occasion and to celebrate a new beginning. Just this week, Christine, was digging around in her wedding stuff - and found these pictures. They were taken at the reception - the father of the groom, my husband, Carroll, laughing - tickled to the heart of him about something - for by all accounts it was the best wedding ever of all time. (I think it was partly the adrenaline of everybody surviving the flights and perhaps a little (well really more than a little) alcohol). 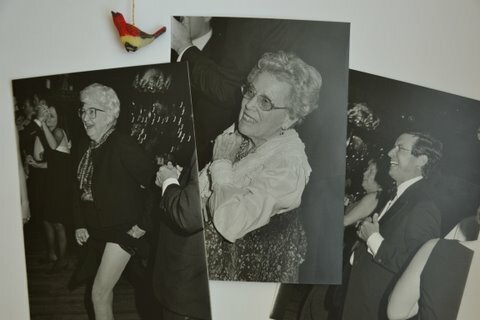 My mother in law at 84 - doing a sort of can can. She acted very bad all night and everybody loved it. She's dead now - in her sleep just like she wanted. And then the best picture I've ever seen of my mother. And all these years until this one little picture we really thought she had been miserable that night; the party was loud and everybody dancing in trios or circles or by themselves or whatever and it was kind of crazy and yet here she was - and if you get nothing else out of this memory - please get this - what we remember in our own little heads through our own fears and blindspots- is never all there was and not all there is - blessedness, grace are always in the picture though sometimes deeply hidden. So here was my mother - serene, so happy, just taking it all in and at peace and I really believe now seeing this all these years later - she was looking into the future and sensing the fullness of life passing from generation to generation. She's dead too after a brutal siege of Alzheimer"s. But new life has come to our family. Generation to generation. The day after the wedding was Mother's birthday and my brother hosted a birthday dinner which was very fine. She gave us each a small pin and said we were now members of The Redbird Society. We said Mother what is this Redbird Society? And she said that she just likes redbirds and that we lived through the wedding and it was her birthday and she wanted us to remember. But I think she was really wanting in her no nonsense way to point to something deep and sacred. And so now I am inviting you to be a member of the Redbird Society - for I think it means to remember we belong to the God of life not death. I think it means - notice the radiant and free to be beauty and song and swoop of your life. Love your life. Love the lives of others. Reach out to somebody you know would really like that. Be hospitable to strangers - they are angels unawares. Give people second chances. Make small gestures of reconciliation. We are dying across the globe for gestures of reconciliation. Don't regret and argue about the past. Redbirds don't do that. We live toward the "after." We make little hops, short swooping flights always toward God's future. Immeasurable, ephemeral yet eternal - and I believe of such is the reign of the One who said, here's more wine for the wedding. And don't forget to consider the redbirds.